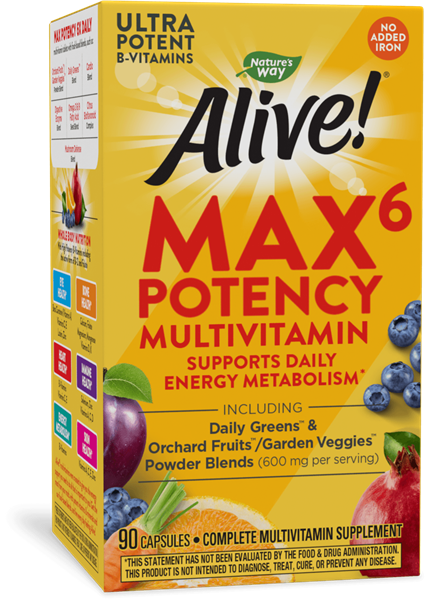 Alive!® Max6 Daily Multi (No Iron) 90VegCp - Nature's Way®. Our Max Potency Multi-vitamin in a no iron added, in a vegetarian capsule. Take 6 capsules daily, preferably with food. If pregnant, nursing, taking any medications or have high blood pressure, consult a healthcare professional before use. Contains the amino acid phenylalanine. Not formulated for children. Do not exceed recommended use. Our Max Potency Multi-vitamin in a vegetarian capsule. Our Max Potency Multivitamin - with no iron added!